Home » JonathanJimenez16 » Reviews16 » Review: Why Him? Will you be asking "why did I see this movie" after watching "Why Him"? The holidays are here again, and like every other year we are bombarded with a variety of comedies. 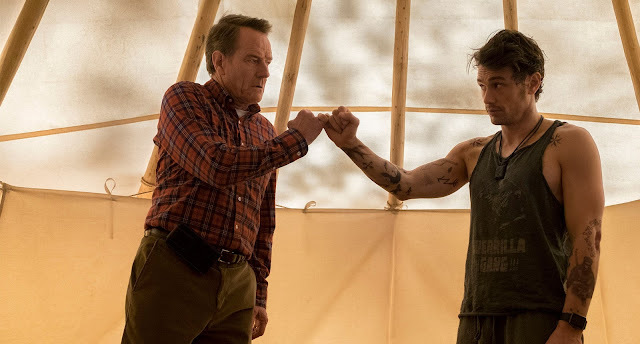 Why Him stars James Franco and Bryan Cranston an unlikely duo that I personally did not think would ever make it to the screen. (I always forget Cranston starred in Malcolm in the middle, with that being said I'm sure he's up to costarring with anyone). I'm sure you're all expecting another raunchy film from Franco, however you might be pleased to know it's not that crazy. Although Franco is performing the same crazy character it doesn't hurt the plot because it's the same harmless Franco his viewers have grown to enjoy. Throughout the film I was expecting the duo to one up one another with crazy antics that would ultimately lead to making the plot worse every single time. And if I've learned anything from movies that do so, it cheapens the plot for quick laughs. Fortunately there is some hope because there really is only one crazy defining moment that furthers the plot. Around every corner there are hilarious and subtle jokes and where most films fail this comedy succeeds by not only trying for laughs but having a romantic love story mixed in. This is definitely a film the kids should stay home for, but don't worry you've still got Moana. I would definitely take out the scene where the moose falls on the younger brother, that was just awful and in poor taste. For fans of kiss you'll be pleased to know they make a cameo at the end!